Recently, EuroAlco SRL has turned 24 years old. The main line of the company’s business was always export deliveries of high-quality wine and wine materials from Moldova. However, “thanks to” the Russian wine embargo in 2006, the management had to make an urgent decision about the future of the company. EuroAlco was one of the largest suppliers of wine products to the Russian Federation, and after the embargo, exports turnover slumped, and a huge amount of products ready for shipment turned to be non-demanded. The company was going through a very difficult period. However, the solution has come about. Few people know that the oldest distillery in Europe, built by Shustov in 1898 and having an important historical value, is located in Chisinau. It is noteworthy that it is located on the territory of the EuroAlco factory. It was one of the reasons for making decision to refocus the company to production of divins. To be the successors of Shustov’s business, who was a master recognized even in France, is not only an honor, but also a huge responsibility. We had to modernize the production urgently, to increase the raw material base, engage new specialists, and look for new market outlets. Both patience and endurance was required since the richness of taste and aroma of each divin depends on the period of aging of brandy spirits. This year, the first divin made 12 years ago is maturing in the company’s barrels. The company has set the goal of bottling divins only from its own brandy spirits, which guarantees stability and high quality of the product. 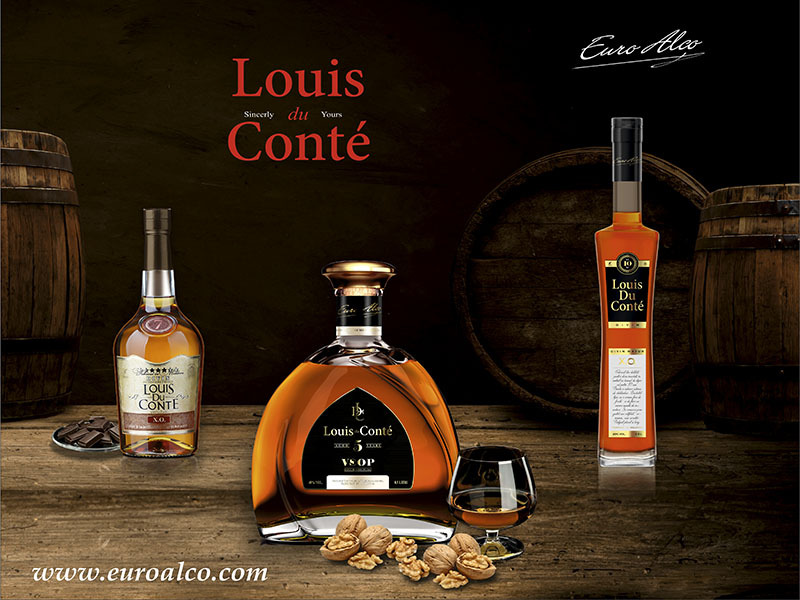 The first achievement in 2010 was the line of divins under the brand name Louis du Conte. Together with our partners from other countries, we developed the product that was as good as the best French cognacs by its taste and quality. This was a so-called “French line”. Despite the success, which Louis du Conte won very quickly both in Moldova and in many other countries, EuroAlco did not stop there. Recently, a new, truly Moldovan brand – Marele LOGOFĂT divin has been submitted to the consumer’s approval. This is a special pride of the company. Exclusive features of LOGOFĂT divins comprise its recipe, proper high-quality raw materials and ageing of brandy spirits in oak barrels only from Moldovan and Romanian mountain oak. In Moldova, many consumers are good judges of high-quality divins, but even they have sometimes difficulty in making a choice in favor of a manufacturer or a brand, taking into account the abundance of products in our market. Often, the main criterion when choosing is the price. However, the high price does not always guarantee quality. The same is true about the low price, it does not mean that the product is bad. Why does five-year divin of some manufacturers cost much less than that of the others? In fact, this is because of the production cost. Since EuroAlco SRL has its own brandy spirits, production facilities and sites that provide a full technological cycle, in particular the vineyards of the southern and central zones, the primary winemaking plant, the secondary winemaking plant, cellars for aging and maturing of spirits, advanced bottling and corking lines, own accredited laboratory, the price of the finished product is very affordable. Therefore, the factory team hopes that every family in Moldova will be able to decorate the New Year’s festive table with high-quality Marele LOGOFĂT and Louis du Conte divins produced by Euro Alco. Five-year old Marele LOGOFĂT is of golden amber color. A rich floral aroma with pleasant chocolate tones makes this divin special. It has a harmonious taste with hints of chocolate, vanilla and almond. Seven-year old Marele LOGOFĂT has a rich bright aroma with hints of fig jam, spices and dry wood. The brandy age is well emphasized by an elegant, strong, resinous and balanced taste with nutty and chocolate tones, with a long aftertaste and rich harsh flavor. Ten-year old Marele LOGOFĂT is an exquisite brandy. The color is dark amber with golden glints. Its aroma combines fruit and flower notes harmoniously. Best of all, it is revealed if you pour it into a tulip-shaped glass and let it “breathe” by warming it in your palms.